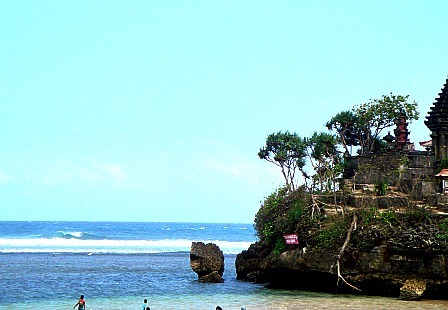 Located about 2 hours’ drive, about 65 km from Malang city, makes this Balekambang Beach very attractive and interesting to visit if you’re staying in Malang. On the last day our staying in Malang, we were visiting this spot. It’s not expected actually, we weren’t aware and unprepared with what we saw. 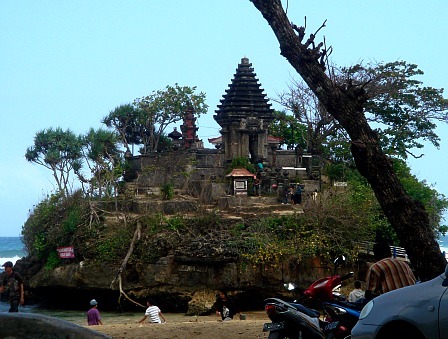 Honestly, this beach is really unique with a huge rock island in the middle of the sea with a high building in the middle of the island; make the trip to this Balekambang beach would be unforgettable. The beach itself is beautiful with flat and shallow white sand, clear blue sea, with the foaming waves on the beach like a diamond on the shimmering sand and reasonable cleanness, make it very invited in the eye. At any time by the tide left shells layers as lovely and beautiful toys scattered across the sand. 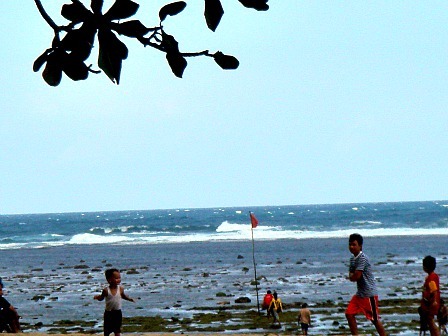 Children play on the beach without any concern, happy in their innocence. What a beauty of the beach. It’s not an expected view when we’re by accident stranded on this spot on our last day in Malang. If you’re lucky you will see small little fishes swimming around the little rocks on the beach. It makes you one with the nature especially if you see the waves comes directly through the beach without any barrier which can stop the strength of the waves. This is one of the beaches that you would like to see and to enjoy. 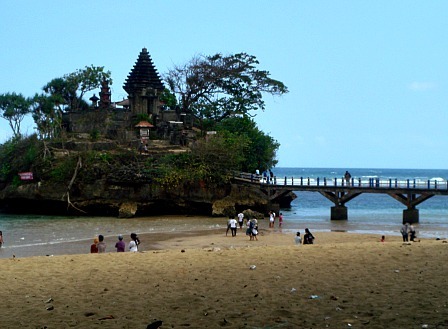 I can see that every beach in Java seems like the same, but it’s absolutely not true. Every beach has own charm. I’ve seen enough beaches around java but still this beach will taking your breath. You can walk to the island Ismoyo where the lovely building on stage through the bridge. You can only do this only during the low tide. When its flood you can’t even see the bridge, so it seems that the island unreachable is and give the mysterious air. These two combinations make this rock island a fascinating spot. Admire also the sunset from this beach, it would be captivated your imagination, it’s romantic and try to catch it in your picture. I have to admitted, I can’t make any picture of sunset because we have plane to catch so we weren’t stay that long on the beach to catch that breathtaking picture of mysterious air between dark and light.